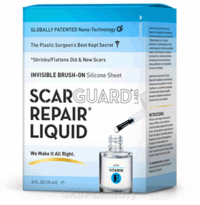 Thousands of dermatologists and plastic surgeons nationwide uses Scarguard the treatment of scars after surgery, injuries and on old scars as well. They know Scarguard really works! This patented formulation is a liquid that dries quickly to form a nearly-invisible protective film.